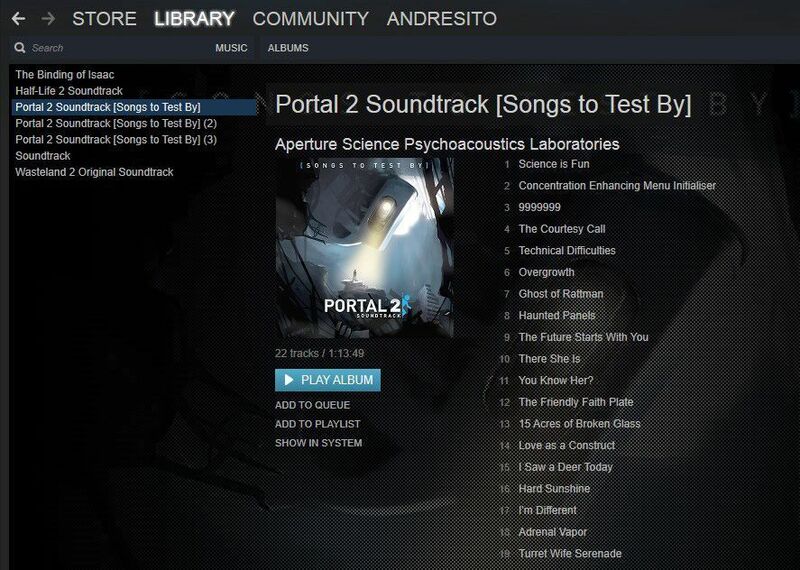 One of the latest novelties in the Steam client, alongside its exhaustive facelift, is its new music player that lets users listen to the soundtracks of its games. There’s a problem, however. This feature has a rather annoying limitation, which is that you can only listen to the soundtracks of the games installed on your computer. Why? Steam treats soundtracks like DLC, and DLC is only installed when the game itself is installed as well. The solution? Simple. Open the Steam console: steam://open/console (you have to have Steam open for this to work). Type the following into the text field: download_depot ___ ___, with the first field being the game ID and the second the ID of its soundtrack. Wait for it to download. There’s no progress bar, but it will send a notice when it’s finished. The final step to view your soundtracks and listen to them is to add the folder where the list has been downloaded to your Music Library. To do so, just click on Steam > Settings > Music > Add > C:Program FilesSteamsteamapps. (Obviously, if you have the “steamapps” folder somewhere else, click that instead.) Once the folder with all the soundtracks is added, you just have to click on “scan” and voilà.